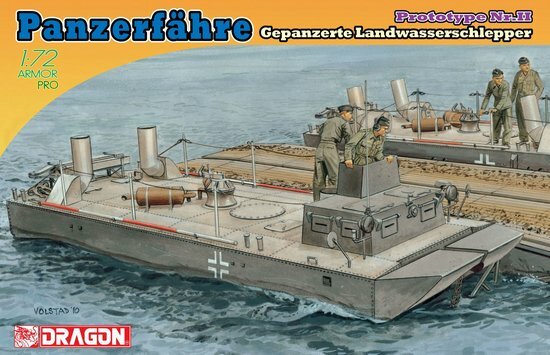 - Panzerfahre Gepanzerte Landwasserschlepper is authentically produced. 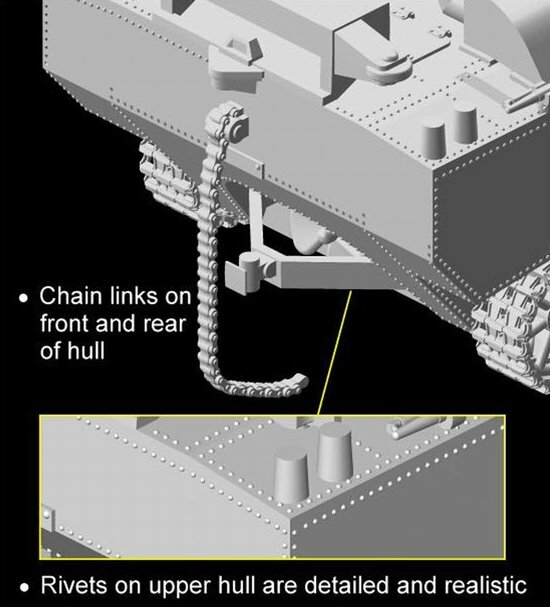 - Chain links on front and rear of hull. - One-piece DS tracks reproduced. 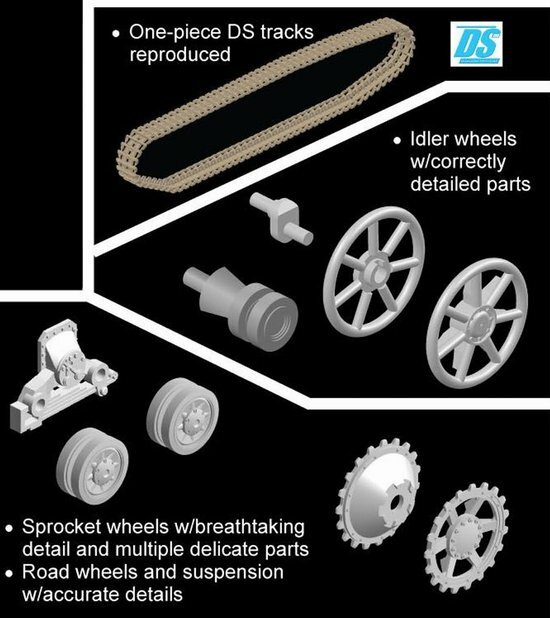 - Idler wheels with correctly detailed parts. - Air intakes accurately presented. - Commander's compartment intricately produced. - Spotlights exhibit extreme detail. - Detailed assembly with 3D-designed engine exhaust mufflers. - Crane is intricately represented. - Sprocket wheels with breathtaking detail. - Road wheels and suspension with accurate details. Last year Dragon released a stunning 1:72 scale plastic kit of Panzerfähre Prototype Nr.I, and it justly received international recognition by winning the “MODELL FAN” award in 2012. That kit is now being joined by another identically scaled model, this time depicting Prototype Nr.II. It’s destined to be just as hot! The Panzerfähre (abbreviated to ‘PzF’) was an amphibious tractor conveniently based on the chassis of a Panzer IV Ausf.F tank. Development of the Panzerfähre began in early 1941, and by mid-1942 Magirus had delivered two prototypes. The lightly armored, fully tracked vehicle had a boat-like bow and a propeller at the stern. The amphibian’s main function was combat supply on land and in water. It could tow an amphibious trailer, or alternatively it could work in tandem with another Panzerfähre as a floating ferry platform capable of carrying a 24-ton load. However, because heavier tanks were appearing on the scene, the PzF never went into production because of its inadequate payload. The new 1:72 scale kit makes clever use of parts from Dragon’s Panzer IV models – for example, the wheels, suspension and tracks. Many aspects are obviously shared with the earlier PzF Nr.I kit, with changes inserted where necessary for the later vehicle. Details such as hull rivets are delicately rendered, while slide molds are widely used to improve the quality of molding. Modelers will thus find that it assembles easily. The kit includes the craft itself but not the ferry pontoon. The finished item is a spectacular vehicle, and the smaller scale allows space for modelers to place it in a suitable diorama showing a river or riverbank.